The bubble eyed goldfish is a looker; there is no doubt about that fact. There are only a few species of tropical fish that cause onlookers to take second and third glances, at this highly-peculiar and fascinating aquarium dweller. What is it that makes the passer-bys stand and stare in amazement? The eyes, it is all in the eyes. The bubble eyed goldfish is a different looking creature at first glance, and this gentle-tempered and strikingly beautiful fancy goldfish has been a staple in the aquariums of the world for centuries. 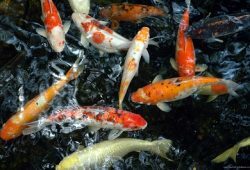 The Chinese found favor with the bubble eyed goldfish during the Han Dynasty and the ruling family even went as far as declaring the little oddity, a national treasure! 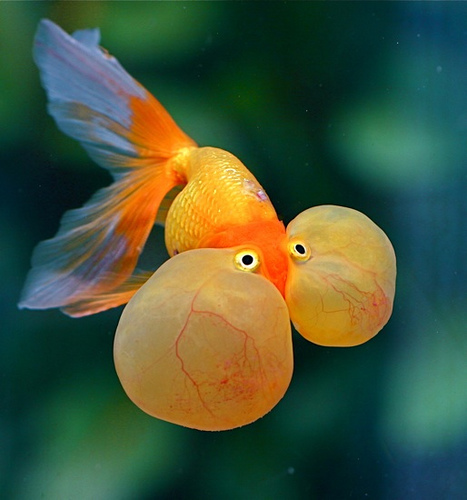 The trek from the Far East to the shores of America ensued and now the bubble eyed goldfish is one of the most popular of all the fancy goldfish varieties. What sets the bubble eyed goldfish apart for its contemporaries in the tank are those splendid yet fragile eye bladders. The fluid-filled sacs are used for mating purposes as a show of brilliance and serve no other primary function. The sacs are a bit of a burden actually as the fish labors to swim and keep itself erect, especially in rougher waters. This is why any aquarium owner should follow these simple yet effective steps when housing a bubble eyed goldfish in an aquarium. The bubble eyed goldfish is a splendid aquarium tenant as the fish displays so many wondrous characteristics, unmatched in the tropical, freshwater fish world. Aside from the spectacular eye-popping bladder-sacs under the optical, the fancy goldfish has flowing, silky-appearing fins, which present a show of rhythmic wonder. As far as a goldfish goes, this interesting variety of the big-eyes seems quite at home in a smaller tank as long as there is good clean water, plenty of food, and a few agreeable and non-predatory neighbors! 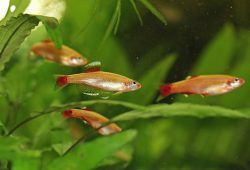 The ‘bubble eyes’ start to develop around the 6 month time frame and will be fully-developed around the 24 month mark, in the goldfishes life. The enjoyment that can be had from watching these marvelous little big eyed fish swim about cannot be missed! The goldfish are very agreeable tenants and can be a welcome addition to any aquarium that lacks a little pizzazz and excitement! By ensuring the health and safety of these interesting and spectacularly decored fancy goldfish, the fish-lover will be rewarded with years of fun and enjoyment. 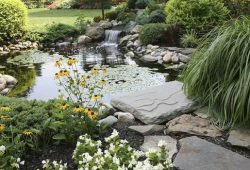 The impudence is on care and feeding as well, since every fish in the aquarium is a wanted and vulnerable guest that deserves adequate nourishment and a watchful protecting landlord!